Silvia Rizzo and Donnerbube 2 in Jablines, France, in October 2013. Photo by Eric Blanco. Wellington, FL – December 13, 2013 – Italian Grand Prix rider Silvia Rizzo and her partner, the former Italian Olympic eventing coach Michele Betti, are packing everything from bridles and bathing suits to saddles and shorts to spend the 2014 show season in Wellington, FL. 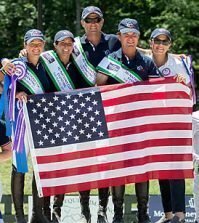 The two fell in love with the weather, the level of competition and the friendly atmosphere in South Florida after Rizzo rode in the 2013 World Dressage Masters Palm Beach CDI5* last January. The pair lives in Germany at their training center, Hof Marabunta, and they are eager to trade snow for sand. 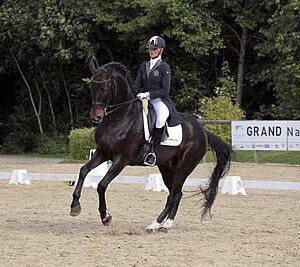 Rizzo plans to enter shows at the Adequan Global Dressage Festival with one of her horses but will leave her World Dressage Masters mount, Donnerbube 2, who is affectionately known as Bubi, at home in Germany. Bubi captured the hearts of fans last season with his tall, dark and handsome good looks and his penchant for bananas, while Rizzo’s fashion flair caused quite a stir. “I was asked for my autograph while at the mall in Wellington,” she laughed. Rizzo and Betti also plan to give lessons and clinics while in Florida. 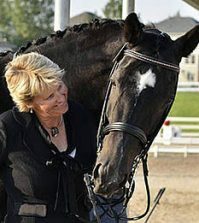 Rizzo began her international Grand Prix career in 2009 and was short-listed for the World Equestrian Games in 2010 and the European Championships in 2011. She has achieved outstanding results in CDI competition in Europe, the Middle East and the U.S.
Betti currently gives dressage, jumping and eventing lessons in Germany. He was the chef d’equipe and team trainer for the Italian eventing team at the 2004 Olympic Games in Athens, the 2006 Olympic Games in Aachen and the 2008 Olympic Games in Hong Kong. He was awarded the title of “Master of Excellence” for his achievements. In between the competitions, she has a full dance card of fun planned for the season. “I will visit the part of Disney World that I hadn’t time to visit last year,” she said. “I want to kiss Mickey Mouse again!” She also hopes to visit the beach and of course, the fashionista intends to hit the shops. A photo shoot in Palm Beach with one of her sponsors, the Italian equestrian sportswear line Accademia Italiana, is already in the works. She brings a full cadre of sponsors with her, including her U.S. sponsors MDC stirrups, Wellington Dressage Boots for her horses’ boots, and Bondbers.com, which provides her saddle pads, SSG gloves, Cur-ost natural supplements and Triple Crown Feed. 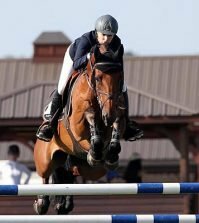 Her European sponsors include saddle and tack purveyors Selleria Pariani and she wouldn’t be a fashion trendsetter without her sportswear and jewelry sponsors. In addition, My Secret Sparkle keeps her blingy and flashy with their bracelets. They will even keep her dachshund, ZigZag, fashion forward for his trip across the ocean. “The only sponsor that I must leave at home is Motorrad Center Wessmann because my wonderful quad has to stay at Hof Marabunta!” she lamented. 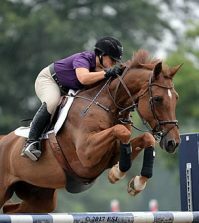 Rizzo and Betti are looking forward to helping U.S. riders with lessons, training and clinics and will be happy to travel around the South Florida area to give individualized instruction. Contact them via email at info@hofmarabunta.com for more information. To learn more about Rizzo and Betti, go to www.hofmarabunta.com.